Consider yourself a fan of perfect design? One of my all-time favorite models of Swiss Army Knife both to use and to collect has got to be the Model 1961, a design that exists in slightly different guises and markets as the Soldier, the Standard Issue, and the Pioneer. The latter knife first appeared in 1957, and the basic design was so perfect that it has continued as a current Victorinox production model every year since then (62 at the time of writing). Four years later, in a reversal of what seems to be the typical direction of technology transfer where military kit is concerned, the civilian Pioneer served as the basis for what was to be the Swiss military’s new standard issue knife, and the Model 1961 was born. It was first issued in June of 1962 and continued right into 2008, until it was finally retired and replaced with an entirely new model. But because the Model 1961 was spawned by the Pioneer, and because the Pioneer is still in Victorinox’s catalog and probably always will be, any discussion of the Model 1961 would not be complete without an understanding of the design perfection of the Pioneer. L to R: Soldier, Standard Issue, Pioneer. The many names of this pocket tool dynamo can be confusing, so to clarify at the outset, “Model 1961” correctly refers to SAKs actually issued to the Swiss armed forces and produced by either Victorinox or Wenger. The model names “Soldier” and “Standard Issue” refer to the Model 1961 SAKs produced by Victorinox and Wenger, respectively, and eventually sold on the civilian market. For simplicity’s sake, however, I will use the word “Soldier” to synonymously refer to either issued or surplus SAKs produced by either company. Finally, I will use the model name “Pioneer” when referring to the Victorinox Pioneer, which, of course, has itself always been just a civilian version of the Soldier. The Elinox tang stamp tells you this is an early Pioneer. The original Pioneer from 1957. Note the rear Alox scale is cut away to accommodate the reamer, a design feature that quickly changed. Picture credit: Victorinox.com. The earliest Pioneers came in three colors and featured a plain Swiss cross on their top scale. Sometime in the late 1990’s, Victorinox ceased use of the “old cross” and started using the same shield and cross device that their officers’ knives had used since 1909. Over the years, a few variants of the knife have appeared, which substituted a specialty tool for the can opener. And a third layer has been added to create yet other models, like the Farmer, which adds a wood saw, and the Pioneer X, which adds scissors. By the time the Model 1961 emerged, the design of the reamer implement was changed such that the rear scale of the knife didn’t have to be cut away to accommodate it. It is this basic design that is still in place today, and has been in continuous production since then as either the Pioneer, the Soldier, or both. To really appreciate the Pioneer in its full evolutionary variety, you’ll first need to know a little about its implements and uses. The redesign of the reamer implement allows the back scale’s profile to be a mirror image to the front’s. Big, burly knife blade; issued knives have the year of manufacture stamped on the tang. Not much else to say here. Cap lifter, scraper/stripper, slotted screw driver with 90° detent. Beer, meet opener. Reamer. A tool from your grandfather’s era, which remains strangely useful today. Can opener, small slotted/Phillip’s screwdriver. You remember cans that had to be opened with a tool, don’t you? The Pioneer’s four implements offer almost unlimited utility. The Pioneer’s implements are what truly sets it apart from what most of us picture when we think of a typical Swiss Army Knife. They are very stout, and are spec’ed to a robustness that will take you by surprise if the only other SAK you’ve handled is the Spartan you got for your 12th birthday. Nothing against the Spartan of course; I collect those too, but for different reasons. But the Pioneer’s implements and springs were designed to stand up to the toughest applications encountered in the field. The very sturdy implements of the Pioneer. The can opener implement is perhaps the least useful in our modern world. It seems like most canned goods these days come with pull-tabs, but for those that don’t there are usually better options for opening cans provided you’re in your own kitchen and not in the field. But even this implement offers collectors an opportunity to appreciate variation, because prior to the early 1970’s the Victorinox can opener featured a +PAT patent mark on its shank. If you have a really old VSAK of any size or type, check it and see if it bears this mark. The Swiss patent mark on an early Spartan and a Soldier. Realizing this, perhaps, Victorinox often replaces the can opener implement with a specialty tool. Enter the Technician, Electrician, and Rancher, which offer a fine screwdriver, an electrician’s blade, and a hawk’s bill pruner blade, respectively, in place of the can opener. The Electrician and Rancher are still made today, but the Technician is long retired and hard to find now. The Electrician (L) and Technician (R) substitute specialty tools for the can opener on the Pioneer. From the Pioneer to the Soldier. 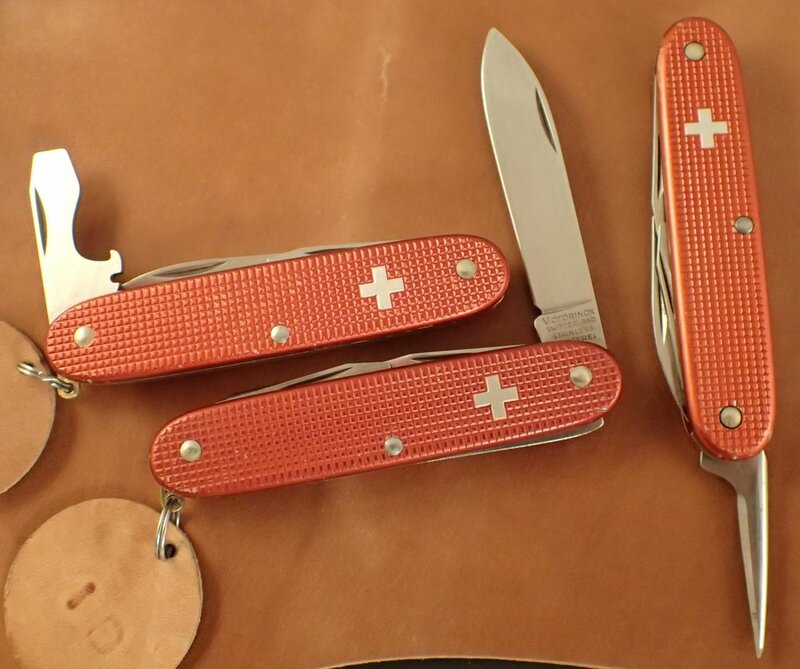 The Pioneer is a classic, and Victorinox is skilled at coming up with color variants and endless limited editions that keep consumer interest in the knife very high. Hmm, remind you of a certain rather famous Swiss Made chronograph? That’s right, you could consider the Pioneer and its military-issued twin, the Soldier, as the Speedy Pro of the SAK world. A design so perfect when it appeared that it remained in use by the Swiss military, virtually unchanged, for 46 years, and the Pioneer is still in production today. Bookended Soldiers from 1962 to 2008, first and last years of production for Victorinox. If you’ve read my other articles on Swiss Army Knives, you’ll know that I’ve always had a preference for SAKs produced by Victorinox as opposed to those made by their now-defunct Swiss competitors, the Wenger company. But in the case of the Soldier, the distinction is only academic since the knife was produced by both companies to identical specifications. In a way that could only be described as being, well, very Swiss, the two companies shared the production and supply of Soldier knives. Although ostensibly identical, there are in fact numerous tiny differences that can be discerned by the keenest observers, but I own both Wenger and Victorinox Soldier knives and consider them completely equal in quality and desirability. However, since the original Victorinox Pioneer served as the design basis for the Model 1961, I think it only fair to give the credit for the genius of its design to Victorinox. The Wenger Standard Issue, as sold by LL Bean in the late 1980’s. Collecting issued or non-issued Soldier SAKs is a fun way to bring a little focus to a larger collecting goal within the universe of Swiss Army Knives, which, like the universe we live in, is essentially endless. Although it would certainly be feasible to collect every Soldier year of issue from 1962 to 2008 without much difficulty, it’s even more practical to focus on the half-dozen or so subtle variations that exist and pick representative specimens of each. Over the years, very small tweaks were made to the knife and the resulting micro-differences are ripe for a collector’s appreciation. If you do nothing more than pick up just one or two specimens within each variant, you’ll end up with a curated, bookended set of useful tools that are easily stored, fun to carry and use, and just right for tasteful display. Representatives of the six main versions of the Model 1961. Other evolutionary characteristics and markings. I am not expert in the history of Swiss armament, but for the first 25 or so years of the Model 1961’s issue, all Soldier SAKs issued to members of the Swiss armed forces were under the supervision of the Waffenkontrolle, and early models contain its stamp of approval on the knives’ scales. The stamp was meant to denote that the individual knife had met rigorous specifications and was approved for use. It underwent some subtle changes over the years and the variation is interesting and collectible, as it is with the Swiss cross and shield device on the top scale, the knife’s hollow bottom pivot, and the maker’s marks on the tang of the main blade. At right, the Waffenkontrolle (W-K) stamp of acceptance can be seen on the earlier Soldier. Prior to the disappearance of the W-K approval stamp, its presence was the only way to know the difference between a Soldier knife that was actually issued and one that was sold as surplus on the civilian market. After Switzerland stopped requiring the stamp, issued and non-issued SAKs became for all intents and purposes identical, which is considered a loss to the collector community. Perhaps most compellingly, every Model 1961 and Soldier knife has its year of production engraved on the shank of the main blade. As any vintage watch enthusiast will appreciate, this presents some interesting collecting avenues. Yep, you guessed it, the birth year SAK is a thing, just like the birth year watch. And what’s cool about collecting Soldier SAKs, at least if you follow the strategy I’m suggesting here, is that you can easily afford to have your own BYSAK and a collection of Soldiers from any other interesting or meaningful years in your life. Kids’ birthdays, graduations, career milestones, the year you were wed — think about the possibilities here, to say nothing of giving BYSAKs to friends and family members as charming and useful gifts. And keep in mind that this article is only about the Model 1961 Soldier, but every Soldier SAK since the very first one in 1891 has had this stamp. So if you really want that SAK that will always remind you of the year your great grandparents got hitched, it’s out there somewhere. A father-son pair of birth year SAKs. This concludes Part 1 of this article on the Victorinox Pioneer and the Soldier SAK that its design spawned. Part 2 will describe the six main generations of the Model 1961 and follow its evolution from its first issue in 1962 to its retirement in 2008. As always, I welcome your feedback and comments. If you know something about the Pioneer or Model 1961 Soldier that I got wrong, please leave a comment. And thank you for reading. Collectible variety with the Victorinox Pioneer. Collecting the Model 1961 Soldier Knife, Part 2: Fun and affordable collectibility meets Swiss Made.